The good news is that all health plans now have to cover intensive behavioral treatment for anyone with obesity. But much of the details of who provides what services is something that the individual plans are defining and you can be pretty sure it will keep changing over time. That’s the big change. But options beyond behavioral treatment are changing more slowly. New drugs approved for the treatment of obesity are gradually being covered by more and more plans. Some industry sources say that coverage is only now reaching past 50% of plans. 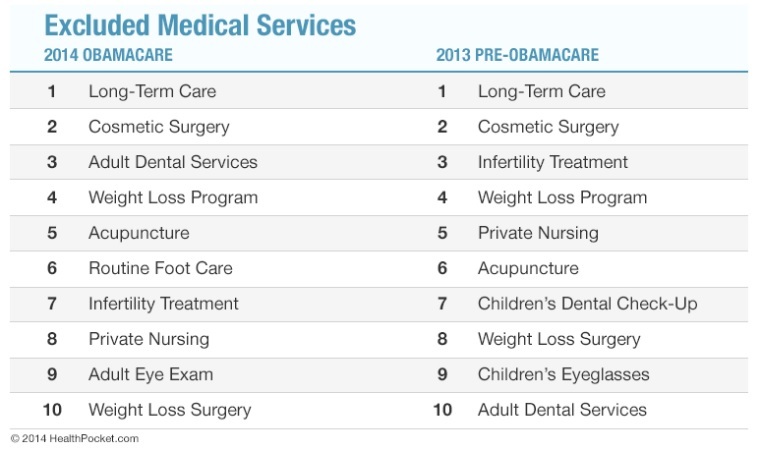 And if you look at a list of the top 10 healthcare services excluded from coverage before and after the ACA went into effect, you’ll see that medical weight loss programs and weight loss surgery were on the list before and they’re still on the list now. The only difference is that weight loss surgery has moved from #8 on the list to #10. The list was developed by HealthPocket, a health plan ranking and comparison service. So anyone who expected the ACA to solve all our problems with access to obesity treatment services overnight is facing a big disappointment. Coverage is a moving target. Some parts are moving quicker than others. Click here to read more in the San Diego Union Tribune, here to read more from HealthPocket, and here to read more from ConscienHealth.